In the 16th century, Juan Ponce de Léon spent his life searching for the mysterious Fountain of Youth, hoping to become immortal after drinking the waters of everlasting life. We don't know what his plans were for after that, but probably to take the Spanish crown and create a worldwide empire wielding his limitless power. That, or buy really cheap Apple stock in the 1990s. Who can say? But the Fountain of Youth doesn't exist (so they say, anyway. We remain skeptical. ), so how can you live forever without it? 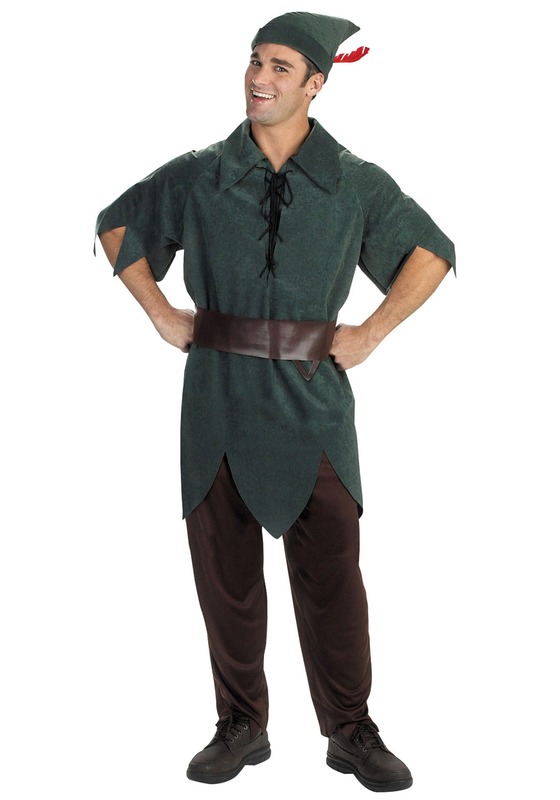 With this Peter Pan costume! Yes, Peter Pan refuses to grow up living in Never Never Land, instead spending all his time with the Lost Boys (not the movie starring Jason Patric, Corey Haim, and Kiefer Sutherland, that's totally different) and playing tricks on Captain Hook. The point is, Peter Pan doesn't age. You've gotten sick of those gray hairs at your temple, the crow's feet nipping at your eyes, the ache in your knees, haven't you? Gone are the days when you could eat and drink without consequence. Gone are the days of being able to run a city block without feeling winded. What is a man to do? Turn back into a boy! Did we mention this costume will give you the ability to fly? No? Okay good, because it won't. But Peter Pan can fly! Just find a Tinker Bell to cover you in pixie dust, think happy thoughts and away you go! Second star to the right and straight on til morning. Pan's the man!